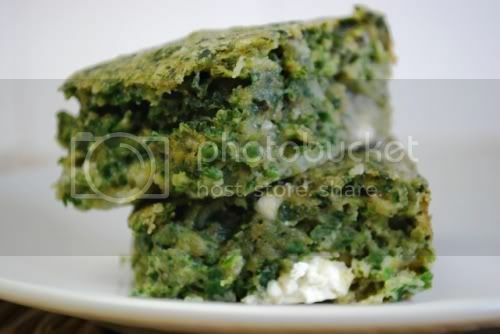 Spinach and Feta Squares - Kosher In The Kitch! Spinach and Feta Squares - Kosher In The Kitch! The following recipe has been adapted from “Food from the Family Tree” by Pat Bell and Bonnie Rasmussen. These squares are very tasty and perfect for summer, just the right combination of salty and fresh, light yet filling. 2. In a small saucepan cook the onion and garlic in the butter over moderately low heat, stirring occasionally, until they are softened. 3. 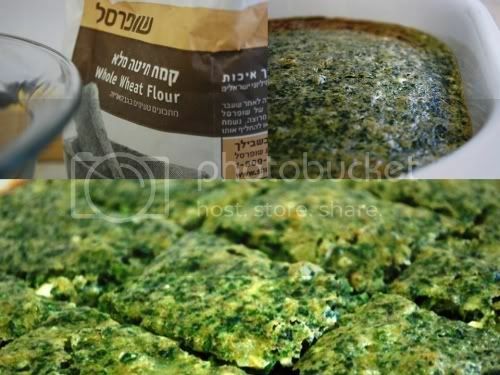 In a large bowl beat the eggs with the milk until the mixture is well blended, stir in the flour, baking powder, thyme, basil and nutmeg, then fold in the onion mixture, spinach and cheeses. 4. Spread the mixture in a 9-by-12-inch baking dish, well coated with cooking spray, and bake it for 30 minutes, or until the top is lightly browned and the mixture pulls away slightly for the sides of the dish. 5. Let the mixture cool in the dish on a rack for a few minutes and then cut it into bite-size squares for hors d’oeuvres or larger squares for brunch. Serve the squares hot, at room temperature or chilled. Serves 12 as an hors d’oeuvre or 6 as a brunch dish. Omgosh, yum! These look so good and I just bought a huge amount of sheep’s milk feta at Costco, so I’m set to make these!